HOMELESSNESS ACTIVISTS WHO took over an unoccupied building in Finglas, Dublin, last night in a bid to house the capital’s homeless safely have ended their demonstration. 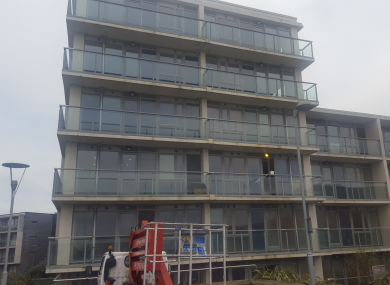 The Premier Love Project entered an apartment block containing 60 units which was built on the former Premier Dairies site. The building, according to organiser Colin McGettrick, has been lying empty for six years. However, when confronted by security and gardaí, they decided to leave the property. The activist arrived at the premises last night with two other people and explained to that they “had entered as peaceful activists” and had no plans to cause any damage to the property. Gardaí were called to the scene and were told by McGettrick that they were there peacefully and were trying to sort emergency accommodation for Dublin’s homeless. The trio left the building this morning. However, McGettrick said a number of Nama-owned buildings had been “cherry-picked” by homelessness activists in recent weeks. “If one goes down, there’s a lot more choice in this city,” McGettrick explained, adding. “I’ve been watching the place on and off for a good while. I’d always see a person sitting at the window. The the other night I looked and I thought ‘that person is standing very still’. It turns out they had thrown a jacket over a mannequin and put it near the window to put people off. McGettrick told TheJournal.ie that the group he is part of is not connected to Home Sweet Home which took over Apollo House earlier this month. He added that they are “not politically aligned” and that “there is no motive other than housing people who need it”. Email “Occupation of empty Dublin apartment block by homelessness activists ends ”. Feedback on “Occupation of empty Dublin apartment block by homelessness activists ends ”.